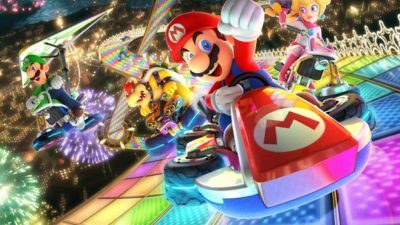 Despite Mario Kart 8: Deluxe’s cutesy appearance, there’s a devilish amount of depth underlying the racing element of the videogame. 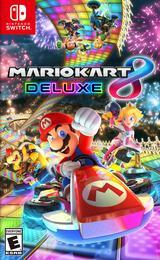 With that in mind – and the fact that the Nintendo Switch is a console designed for experienced owners to welcome in newcomers – Switch Streamers has prepared the following tips to help get you up-to-speed with Mario Kart 8: Deluxe’s special techniques. It’s been slightly different in every edition of Mario Kart, so here’s the deal for Mario Kart 8: Deluxe: at the beginning of the race don’t press anything until the ‘2’ appears on the countdown timer (immediately upon the ‘beep’). This will launch you out in front, so long as no other competitors have scored a boost start as well! 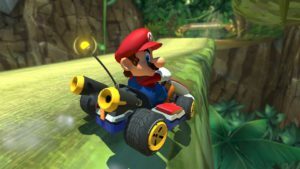 Mario Kart 8: Deluxe retains the drafting boost first included in Mario Kart 7. By keeping a steady line behind the racer in front you can gain a small amount of speed. Holding that line for longer will eventually build you to the point of a significant boost allowing you to overtake them in an instant. 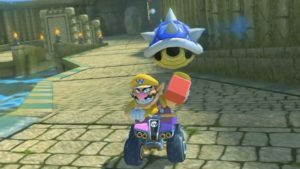 The power-slide technique in Mario Kart has come in two versions; thankfully, Mario Kart 8: Deluxe makes use of the easier method of execution. Simply holding the ZR trigger as you enter a corner will be enough, provided your guide your vehicle around that corner without collision. Soon your wheels will emit a blue flash (which will grant a small boost) but hold it for longer and that flash will turn orange for a much bigger boost. Once you’ve grasped the basics of the technique don’t be afraid to experiment; launch into that power-slide long before you hit the corner and use the analogue stick to correct your angle, tightening in the apex and keeping yourself on-track. 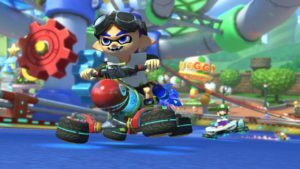 Mario Kart 8: Deluxe features a lot of ramps that allow you to gain airtime and perform tricks. These are done simply by pressing the ZR button just before leaving contact with the ground, and will result in a small speed boost upon landing. However, it’s not just the ramps: there are many opportunities to gain airtime – from crater edges to simple bumps when leaving the beaten path – and once skilled these too can be used to perform tricks. A final tip for those who have mastered all the above: once in first place, you need to know how to stay there. Blue Shells lock onto the racer in first place and speed along the track targeted on them, regardless of who gets in their way. However, in Mario Kart 8: Deluxe, the dispatching of Blue Shell aggressors has been made much easier. It’s now possible to destroy your pursuer with any number of weapons – including split-second usage of green shells and banana skins – however it’s the Super Horn that really makes the task easy. Simply wait for the icon denoting a Blue Shell is encroaching to appear and prepare your Super Horn, wait just a second or two more and then hit that L trigger. You’ll be clear and free to maintain your position with just a little practice!